Vinay Kashyap is a partner at Mainsail where he focuses on growth equity investments in predominantly bootstrapped companies. Over the years, Vinay has developed a unique understanding of the issues facing the bootstrapped entrepreneur. As such, Mainsail’s approach to investing has evolved in an effort to specifically address the issues facing bootstrapped businesses. At its core, as Vinay describes, is a high-touch, roll up your sleeves, and culture-first approach to investing. RJ: Vinay, thanks so much for taking the time. It’s good to see you. It’s been a year or so since we last saw each other. Good to sit down with you. Maybe what we could do to kick off the conversation is talk a little bit about your background and your path leading up to Mainsail. Thanks for having me, RJ. I appreciate you taking the time and all the work you do in the growth equity market. I started my growth equity investing career in 2006 with Summit Partners, working in their Boston office and their London office for several years. I’d done short stints in consulting and investment banking and then found my way to Summit. At Summit I was focused up market from where we are at Mainsail, the fund I was investing out of at the time was $3 billion, and we are currently investing out of a $385 million fund at Mainsail. The original DNA of Summit has some similarities to what we’re doing at Mainsail, which is focusing on more founder owned companies, bootstrapped businesses, and being the first institutional equity into these companies. After several years of training at Summit—which was a wonderful experience where I had some great mentors and learned a lot—and after business school, I wanted to join a smaller platform. I was introduced to Gavin Turner and Jason Payne, the co-founders of Mainsail and the model resonated with me. Mainsail has two key tenets, one we focus exclusively on founder owned, bootstrapped companies. The second tenant is we work closely with our partner entrepreneurs through an Operations Team to help grow their businesses beyond just providing capital. We are able to do this, by having fairly concentrated portfolios, with 8-12 platform companies per fund. Mainsail was very early in the lower mid-market category of identifying operating value add as an opportunity. The two tenets of Mainsail, the bootstrapped focus and then the Operations Team, which we have developed and invested in over the years, have worked very well together. I’ve always enjoyed working with founder owned companies and with technology entrepreneurs. I’ve enjoyed being the first institutional investor in a company as well as being a significant equity holder. We are usually owning at least 30% or 40%, up to 100% of a given company, rolling up our sleeves and working closely with entrepreneurs, and I’m able to do that every single day here at Mainsail, which is great. RJ: Excellent. Let’s talk about bootstrapped companies if we can. What makes that an attractive aspect to a business? It’s a multilevel question and if you go to our website, you’ll see that we are focused on the bootstrapped entrepreneur. One is that it’s a wonderful filtering mechanism for capital efficient software companies. From our perspective, if you can grow a company to $7 to $10 million of recurring revenue without taking on institutional capital, with just maybe some friends and family money, your customers are your venture capitalists, and generally you have found a very strong product-market fit. The demand side of the equation is taken care of in these situations. We like that as a filter as we’re sifting through hundreds of companies every year, it’s a good truth serum for a product market fit in a company. Secondly, the entrepreneurs that tend to build these companies have certain characteristics that we like, they’re fiscally conservative and responsible. They understand the value of a dollar and they have a heightened sense of opportunity cost, they know how to spend a dollar, and how to spend a minute of time. When we do invest and provide capital and resources, we find that the allocation process of those capital resources is done intelligently. That’s something that we also philosophically believe in, the concept of profitable growth. We can have some cash burn along the way, but we focus on companies that have strong unit economics, and underlying business models that allow for capital efficient growth. The filtering mechanism plus the quality of the entrepreneur has led us to focus on bootstrapped companies. Secondly, we feel like we can really help. As you know the industry is competitive, there are a lot of private equity firms, a lot of software focused private equity firms, but our Operations Team is tailored to the bootstrapped entrepreneur. We do an annual survey of bootstrapped entrepreneurs. We have a database with tens of thousands of bootstrapped companies. We survey the database and we actually understand their pain points. What are the biggest issues that they face in scaling? Usually we hear product, talent, and sales and marketing. We custom tailor our Operations Team and our value proposition to that bootstrapped entrepreneur. If you’re a company that has not taken outside capital and you’re meeting with 10 different private equity funds, the messaging and the value proposition resonates well. It’s our way of focusing and sticking to our knitting and specializing in a specific segment of the software market. RJ: It’s interesting. I think a lot of folks in our audience that are either CEOs or institutional investors, when they think of the growth equity space, it all falls into this one big pool of private capital for growth stage companies. There’s not a lot of understanding around the differences between each fund or each firm whereas, if one spends five or so years in this space, they’ll really understand there are a lot of differences between a Mainsail and other growth equity firms. You touched on the operations and the playbook aspect. Maybe there is an example you could share with us on how you’ve been able to identify areas of a business where you could add value and how it was executed on? The first investment I was involved with at Mainsail was a software company called Zen Planner. In many ways it exemplifies a classic Mainsail investment. One, it was founded by an entrepreneur who himself had a problem that he wanted to solve. That’s a common theme that we look for in all our investments. I would say 75% to 80% of the investments we make, the entrepreneur is their own first customer. It’s an interesting component of what we like in a good business. In this case the founder was a martial artist and had a martial arts studio that he frequented that did not have any sort of business management software. It was running on spreadsheets and it had a classic physical point of sale terminal. He was a developer, so he developed some software and he gave it to this studio that he was intimately involved with. That was the first customer. He was servicing a real pain point, something that he had seen over the years. He built the business up to several million of recurring revenue, he had brought in a professional CEO, but when we got involved it was a 30-person company based in Denver, Colorado. They had a couple of hundred fitness studios as customers. It was a situation where we loved the end market, we loved the trends in boutique fitness. We like the authentic problem that the entrepreneur was solving. You can see that authentic connection to the customer and pain point in the culture of the company. Everyone had a real passion for fitness, for fitness studios. We really liked the CEO; Jeff Gardner, that they had brought in. We made a majority investment in the company and rolled up our sleeves and got to work. We recruited the entire management team there around Jeff. We recruited a Chief Technology Officer, we recruited a VP of Growth from LogMeIn. We brought in an independent board member named Joseph Essas, who’s the CTO of OpenTable. He had a real good understanding of small and medium businesses (SMBs). When I say we, I actually mean Mainsail, we have an internal recruiting group. We use this internal recruiting group to bring talent in to our companies. Then we got very involved in a number of functional areas of the business. Obviously the first financial audit, creating KPI decks, and instrumenting the business, that’s the first thing that we like to do with the companies we invest in. You can’t optimize what you can’t measure. Then we spent a lot of time throughout the partnership period on customer success, on understanding, in these SMB SaaS businesses, or micro SMB businesses, churn is always an issue. Understanding how to manage churn, how to look at churn from a variety of different perspectives, what pieces of the product need to get used early to create good retention. One of our Operating Partners, Taylor McKinley, is specialized in customer success and engaged closely with his counterpart at the portfolio company on the churn side. Simultaneously, on the go to market, we built up a sales team of two and by the time we had exited the company, there were over 15 quota carrying sales reps and BDRs. We were a global organization and we had built out an inside sales, BDR program. We very closely involved with our Operations Team, showing the company the playbooks and the learnings that we had along the way. We’re constantly developing the playbooks and when we look across our portfolio, we look for best practices in each of the companies and use that to inform these playbooks. We’re now up to 95 playbooks that we can offer across every major function of a B2B software company. Zen Planner ultimately grew and was exited to Daxko (owned by GI Partners) and was a wonderful experience, I think, for all people involved. It was an example of a really successful Mainsail partnership. RJ: One of the things I noticed when you talked about having an ecosystem and bringing in a lot of skill sets to the company; Mainsail seems to have a very unique culture and obviously, being one of the partners, you’re a big part of that. It takes a strong culture to be able to bring all the resources you talked about to your portfolio companies. Is there something you could share about how you think of culture internally? That’s a great question. We think about it a lot. A few tenets of our culture are focused on blending the investing and operating pieces of our business together. We truly believe in the Warren Buffett perspective of “the more intelligently you know how to run a business, the better investor you are” and vice versa. Everyone here, though we do delineate between an Operations Team and an Investing Team, works very closely together. We have an operating partner sitting on most of our boards and our operating partners participate in the due diligence process. The investing partners and the investing team spend a lot of time learning and understanding what our operations team is doing. In our Monday morning meetings, normally in an investment firm you’re sitting around, you’re going through the investment pipeline, you’re talking about new investment ideas. Our Operations Team is in the meeting. We’re spending time talking about projects that we’re doing in the portfolio and reviewing on a weekly basis case studies where we have had successes in the portfolio. It’s a virtuous cycle that then enables our investment team to go out into the market and explain our approach to the entrepreneurs that we’re trying to invest in and more effectively work with our portfolio companies. This first core tenet is this kind of nice matching between the investing and operating side of our business. We all enjoy that. In another life, a lot of the investors here at Mainsail would have probably been software CEOs, not “finance guys”. The second core tenet is that we really believe that life is short and you should get to choose who you work with. The nice part of our business and our end of the market is that we only make four new investments a year. Four new platform investments a year. Each partner makes one investment. That allows you to sit back and take your time and wait for the right pitch and wait for not only the right company, but the right entrepreneur, someone that you genuinely want to form a five, six, seven-year relationship with. That kind of patience, which I think other much larger funds may not have, especially from a capital deployment perspective. They aren’t able to pick and choose who they work with. We take that philosophy externally and then internally where we recruit folks to the team who are low ego, who are humble, who are driven and smart, but also who can approach a bootstrapped entrepreneur in Cincinnati or Kansas City, or Nashville, and have a real eye-to-eye, heart-to-heart conversation. And we do so in a way so that the entrepreneurs want to work with us. That’s ultimately our businesses. We trade on a reputation. These entrepreneurs have a lot of choices, there’s competition in the market. They ultimately choose a set of people in a firm that they want to work with. And when we exit, they’re our references. If our references don’t speak highly of what we do, then we’re out of business. We pay very careful attention to the culture internally and how that interfaces with the cultures of our companies. So far I think we’re doing a fairly good job at it, but we can always do more and do better. RJ: For some of the other younger professionals within the growth equity space are there a few pieces of advice or insights around this profession that you could share? What you think makes for a good private equity or growth equity investor? I am probably in that younger category myself and learning. I have been in the private equity industry for 12 years, but that’s only a handful of exit cycles if you think about the five-year average hold period. I think about the private equity business and I think about the job in three components generally. I think about it in terms of sourcing and idea generation, in underwriting and deal execution, and in portfolio company support and exit. Just like anything professionally, you need to find the right mix of what you enjoy doing and what you’re good at. You can always evolve both of those over time, especially if you have a good learning mindset. Within the private equity landscape and even growth equity, probably the emphasis on those three components is different firm to firm and category to category. From my perspective, and what we do at Mainsail, because still about two-thirds of our investments are sourced proprietarily without an investment banker involved. The sourcing aspect matters a lot. You have to enjoy travelling, you have to enjoy being on the hunt for great companies. As we say in our business, “we kiss a lot of frogs” and you have to be resilient and have thick skin. You have to ultimately enjoy a very sophisticated sales process. Similarly, in our business, once we make an investment, because the companies are previously bootstrapped, you have to enjoy rolling up your sleeves and participating in the growth of that company. We are recruiting management teams, we’re completing management teams. I would say that more than half of our companies are now doing add on acquisitions to increase scale. We’re adding board members. We’re participating in product roadmap conversations with all of our companies. That’s the level of detail that we get into. One because we enjoy it, two because it’s good business, and three because we allow ourselves to have the time to do that. I am on four boards. No one at Mainsail is on more than six boards and that’s by design. We should all be on four to five boards at any given time, which enables us to engage. Back to your question, I think in terms of being a young investor and figuring out “where do I want to be?” I would look at those three components of investing and figure out what you like. If you want to be more on the execution side and reviewing Confidential Information Memoranda (CIMs) and bidding on lots of deals that you ultimately may not win, then I think an up-market buyout shop might be a better fit. If you want to participate more on the front end of the investment spectrum, the analysis and the stock picking aspect, less so on the company growing and board work aspect, then I think there’s plenty of late-stage venture funds that fit that category. Where you’re a capital provider and a stock picker, but less so involved from a board or day-to-day aspect or week-to-week or month-to-month aspect of the company. It really comes down to figuring out what you enjoy, figuring out what’s necessary in the job, and then every day continuing to learn, because there’s no books that you can read on this. It’s about finding good mentors because this is very much an apprenticeship business. It takes decades to learn how to operate and I’m still very early in my career progress. RJ: Vinay, I really appreciate you taking the time. Before we sign off, is there anything that we didn’t cover that you’d like to talk about or mention? It can be an open forum for any insights you can impart. I appreciate that. I will just end by saying we’re excited that Mainsail gets to participate in this ecosystem. We have been doing it as a partnership for 15 years, previously at Summit for probably another 30 years in aggregate. This growth equity piece of the landscape is an exciting area to work in where your returns are driven by growth. We generate our returns through the recurring revenue or transactional revenue growth of our portfolio companies, not through financially engineering returns and generally not through multiple arbitrage. It’s an exciting place to work and we appreciate that there’s folks like you covering our niche of the investment market. I’m excited that we got to sit down today and hopefully we get to do it again soon. 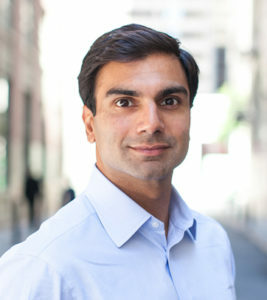 Hear the full conversation with Vinay on iTunes at the GrowthCap Insights page.